One of the benefits of owning a dog is the chance to get out and walk. Dogs are perfect companions in so many ways, including being the best fitness buddy you will ever have. While some breeds are better suited to walking there are loads of pooches that really love to run. Whether you are training for a big race or just like to run to aid your fitness efforts running with your hound can be the perfect way to spend a few hours. However, you want to ensure that your four-legged friend is kept safe. There are potential dangers from the environment in the form of traffic and other dogs, so you want to make sure you have your dog under control rather than charging ahead. Investing in a good running harness is crucial as you also want to make sure your dog is not at risk of injury and this is where a well-fitting, well-designed dog running harness comes into play. A running harness has been specifically designed to give your dog the most comfortable and safe experience when joining you on the run. It is important that the harness you choose fits well, the last thing you want to happen is for your dog to get spooked by something and manage to pull free. Running harnesses have been designed specifically with this activity in mind making them look and fit differently to a universal harness. They will also include a clip that sits around your dog’s shoulder blade to attach the leash. You should always aim to have your dog running by your side or just in front so you can see at a glance that they are happy and keeping up. One of the reasons a running dog harness is designed in such a careful way is to make sure that your dog can move freely. It is important they do not develop any problems with their gait due to a harness that prevents free movement at the shoulders. 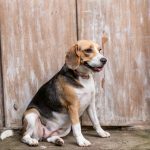 You also want to ensure that there is no chafing or rubbing from the harness as this will make your dogs very uncomfortable. Dogs tend to be very stoic and do not always complain if they are in pain, so care needs to be taken before and after every run to make sure that there are no sore patches. Running harnesses have been designed to make sure your pet can move freely and not place any undue strain on the spine or neck. People often wonder why when running with their dog they cannot just use the collar and leash as they do when they walk. The reason is that you are moving faster and potentially in a more unpredictable way. There is more possibility that the leash can be jerked which in turn would cause undue pressure on the neck. A sudden, hard pull on a collar can cause both problems to the trachea and, problems to the bones of the neck. 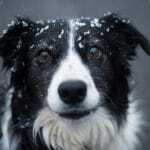 When a dog is running, just like us, they are working harder and breathing more heavily. A crush injury to the trachea can be life-threatening and trying to breathe while being held by the throat is also not going to be a pleasant experience for your four-legged pal. 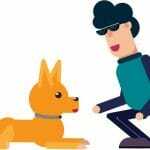 As mentioned above it could be argued that a free running dog is safest; however, there are lots of potential problems that could occur, all of which can be avoided by using a harness. In some cases, the owner also might be running at an event for dogs and owners in which case a dog jogging harness is mandatory, and it helps if your dog is already used to running in this manner. Park runs, canicross and other events are starting to become popular with owners who love to run with their dog. A harness gives you immediate control and you can either hold the leash or get a waistband style leash if you prefer to run with your hands-free. Should another dog come along you can immediately bring your dog to your side, should something small and furry set of the natural instinct to chase, you are not left watching them disappear into the distance, and of course if you are running near roads you are able to keep them safe from cars. There are two main types of running harness, and which the best harness for running with your dog will depend on your furry friend. 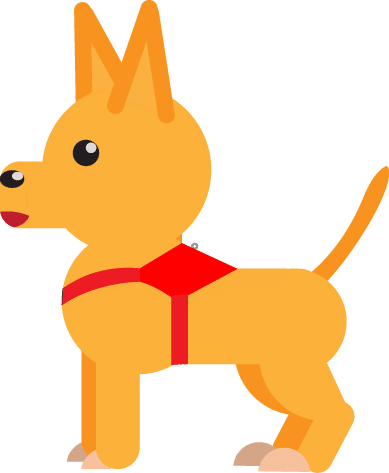 A running harness for dogs tends to either be one that goes over the head and closes around the midriff with a secure clip, or a step in harness that secures with a clip between the shoulder blades. 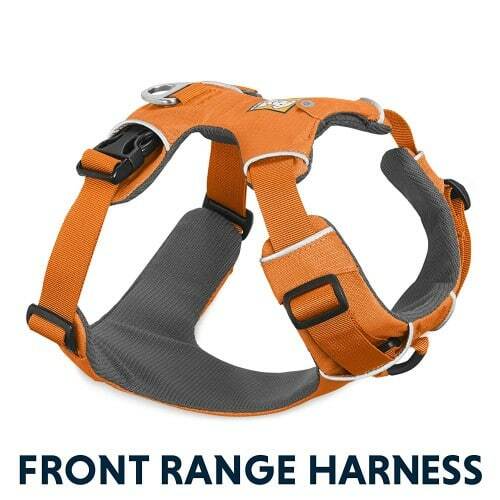 If your dog doesn’t like things going over his head then this might well not be the best dog harness for runners; however, most dogs are comfortable with their owners touching their head to pass a harness or jumper over. Once the harness slips over the head it sits in a similar way to a collar, but further down on the chest to ensure the trachea is clear and no pressure is placed on it. The harness then has a chest plate that passes between the front legs to join the band at the back which sits around the body of your dog and clips closed. On the back, there will be a leash clip. This design offers support under the chest but ensures that the front legs are free to move and not impeded in any way. Some over the head harnesses also offer a leash hook on the chest plate which means you can use them with a double ended leash. This is great for dogs that like to pull a little too much and gives you a safe and easy way to reign them in a little and bring back maximum control. Some owners prefer a step in style harness for their running dog harness. This design features a figure of eight shape with a chest plate separating the two sides. The dog places a front leg in either side, and the harness slips up to meet at the shoulder blades. Again this means that nothing is touching the neck to restrict breathing but that the dog is securely held with a band around the chest and one nearer the waist area. These tend to have two clips that should both be secured to the leash. Again there is freedom of movement on the legs, and all harnesses no matter what style should be checked for chaffing before and after every run. Thankfully running harnesses for dogs come in a wide range of sizes, the most important thing is to make sure you are running at a pace your dog can match comfortably. You should never drag your dog or leave him behind. No matter what harness you choose, remember that your dog should not be left wearing it or you will find they get sore. Only put the harness on to run and then remove once you have finished and are safely back at home or in the car. When it comes to leashes you can use a conventional leash; a double ended leash on harnesses with two attachment points or a bungee leash which is designed to ensure that no sudden movements pull either you or your pet. Of course, you can also have a leash attached to your waist if you prefer to run with your hands-free, but this offers slightly less control so care will need to be taken. 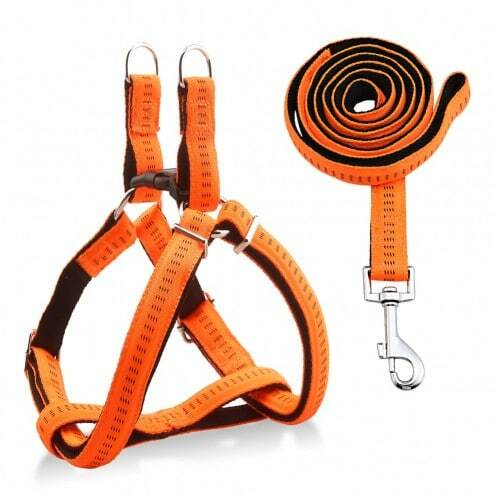 This is an over the head harness that features an excellent full band that passes between the front legs. This means that there is lots of support, so if your dog tends to like to lead the chase and pull out in front, their chest is protected, and the pressure is evenly distributed to avoid any injuries. The harness comes in four sizes which covers all size of the dog, from toy breeds to giant breeds. The harness has four different adjustment points so even within each size you can get the perfect fit for your dog. This dog running harness has reflective strips sewn in at various points which is great if you are out and about after dark. On the back is the main leash hook point however there is an additional point on the chest plate which means a double ended leash can be used for more control to restrain a pulling dog. On the back, there is also a grab handle which offers a great way to get a close hold on your dog if you need to move out of the way of other dogs or passing traffic. 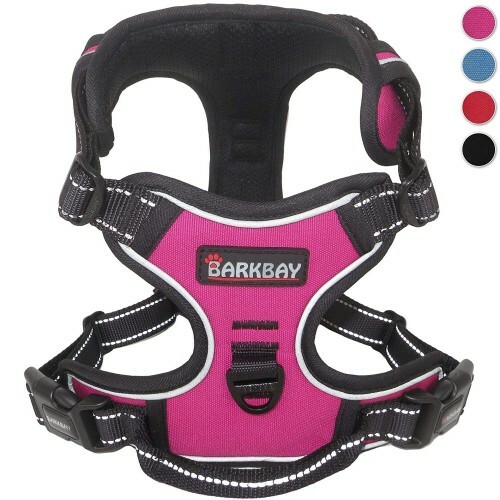 BARKBAY offer durable products that can be used for more than one purpose, so this is also a great harness for securing your dog to the car to get to and from your running venue. Ruffwear have a long-standing reputation for making dog products and their harnesses are well made. 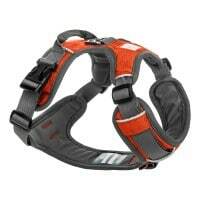 This front range harness comes in five different sizes and has a wide chest plate. Again this is an over the head harness that closes at the back around the waist. The harness comes in a range of colours including blue, green, orange, purple, black and berry. 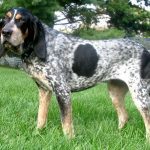 They offer great sizing information and the harness goes right down to toy breeds providing a more extensive size range than some others. Feature two leash points, again designed to help curb an over exuberant dog, there is a lot of adjustment on the harness. 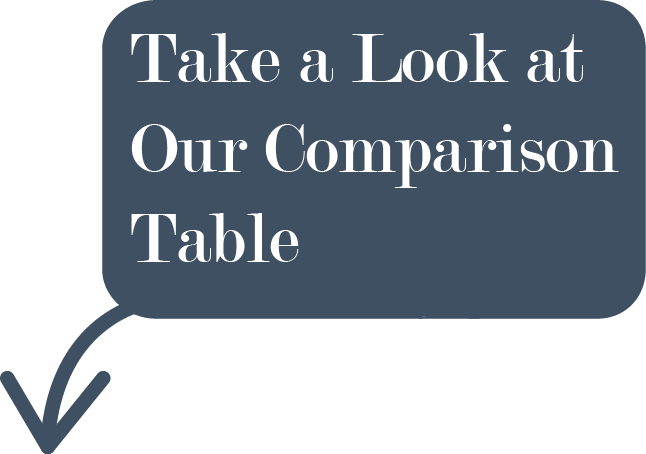 The company states that if you are struggling between sizes, you should pick the bigger size. On the fabric, they have added reflective piping that helps make sure your dog is seen on low light or dark conditions. 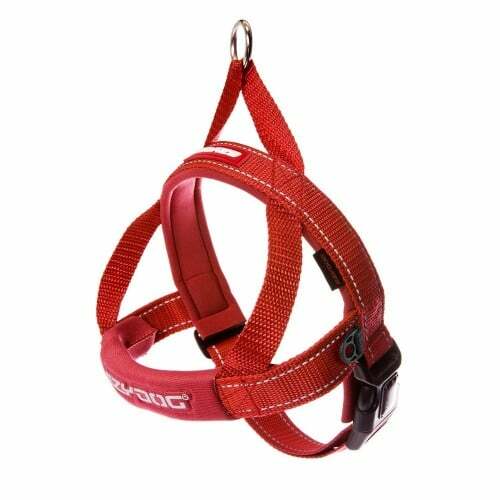 The harness has been designed to be tough and durable making this an excellent choice for running dogs. The webbing and chest plate are padded for comfort and sit nicely clear of the legs and shoulder joints to ensure a comfortable range of motion. There is a hidden id tag pocket, so this doesn’t get in the way or irritate the dog when running. This harness has been designed to ensure that your dog is pulling correctly against the fabric which makes sure that there is no damage to joints and muscles. There is plenty of adjustment on each harness so you can be sure of getting the best fit, and for dogs who really pull you can use the front chest plate leash attachment as well as the standard one on the back. In order to make sure your dog can be seen at night there is reflective trim on the harness no matter what colour you choose. On the back of the harness is a handle which is great for immediate close control or helping your dog up into the car. Embark is keen to stress that their harness is suitable for all breeds and sizes of dog. The step in harness is designed to cradle each front leg and attaches the leash high up between the shoulder blades to ensure an ergonomic fit. Your dog will be able, and there is no pressure on the neck or windpipe area. The padded webbing ensures that you should not experience any chafing for your dog, and there is a lot of adjustment on each of the sizes. The straps have been designed to avoid any twisting which would potentially be uncomfortable for your pooch. There is no reflective tape on this harness, so it makes a perfect day harness. The Urpower running dog harness is ideal for breeds of all sizes but potentially not for giant breeds. The EzyDog Quick Fit Custom Fit Adjustable Dog Harness is an unusual design that comes into the over the head category of running dog harnesses. It is well designed and is offered in ten colours and six different sizing options to enable you to get the best fit for your four-legged friend. EzyDog recommends picking the next size up if you are unsure of sizes and close to the margins. The harness can still be adjusted further to get the best fit. On the front of the harness is a single chest strap, with no check plate going between the legs. The harness is made of neoprene to ensure comfort and no chaffing. The one leash clip sits between the shoulder blades for ease of access. On this harness, you will find reflective stitching to ensure that your dog is easily seen in the dark for night running. The harness has been designed to make sure your dog and move well and can replace a collar, so there is no danger of pulling at the throat and injuring themselves.